Busy Monday: My First Sale! Good Morning! Well it looks sort of dreary outside - but that makes for a great Halloween tomorrow - right? This morning I wanted to share a little fun snack time with you. Both of my daughters went to a Montessori school and learned so many things in such and easier way that I never learned at their age. I was blessed to be able to volunteer at their school often and decided some of the things they learned in school, I could do at home to keep that easier way of learning in our minds. 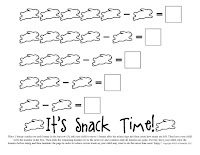 I hopped on my computer one day and made these little Fish & Bunny "It's Snack Time" pages. I even sent the Bunny page to Annie's Homegrown to see if they wanted to share it with their consumers (as my twin sister recommended). I haven't seen it on the website yet or on their emails, but they did send me a ton of Annie's products to say Thanks! That was cool!!! Here's the Instructions: Place 1 cracker on each space in the top row (5), ask your child to move 1 cracker after the minus sign and then count how many are left. Then have your child write the number in the box. Then slide the remaining crackers (4) to the next row and continue until all crackers are gone. 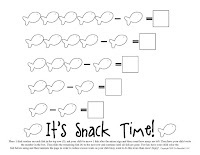 For fun: have your child color the Fish or Bunnies before using and then laminate the page in order to reduce excess waste as your child may want to do this more than once! Enjoy! I am happy to have you share these with friends and family, but instead of placing the files on your own blog, instead please provide a link back to this post. Thank you for your cooperation. When I first moved to Portland, Maine, my soon to be husband and I would get to go out on lots of dates to various restaurants and walks in the Old Port. One of my favorite places in the Old Port was and still is Fuji's Japanese Restaurant. Every night that we wanted to go out, I begged to go to Fuji's because I craved the salad. Finally after going to this place for almost a year, I had to ask for the recipe. Some places will never share their secret recipes...but some do. You'll never know unless you ask! So as soon as I got up the courage to ask what the dressing was made of, our awesome waitress returned with a little torn piece of paper with the following recipe....I call it "Japanese Dressing". So simple and yet So amazing!!!! 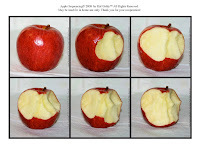 Use 2 Tbsp of each ingredient and 1/4 apple for 2 Servings. Let sit in fridge for at least 1 hour prior to serving to allow the apple bits to absorb the flavors. I've found it can last about 3 days in the fridge, if you don't eat it all at once!!! Parting is such sweet sorrow!!! I make all these bags, sachets, turtles, animals, Tuck 'n' Go's, etc and love them. I love making them. I love the fabrics. I love every stitch. I work on these things no matter where I go and then it comes to me again that one day I'll have to hand them over. Either as a gift, or because it was purchased. I make them and breathe love and life into them, and then off they go. I can't keep them all right?! I wouldn't have enough space. Today I mailed out the first bag sold on Etsy! Not the first one I made, not the first one I've sold (in person)...but it was hands down one of my favorites! It's a red plaid exterior with quilted hearts and upcycled Jessie the Cowgirl sheeting (from Toy Story 2)! I LOVE Jessie the cowgirl. I wish I had a Jessie doll when I was little, she rocks! So my Busy Monday was filled with the excitement of wrapping the bag up and packaging it just right so it would arrive all safe and snug. Thank you to my buyer. (I'd mention the name if I knew that person was ok with it, but can't)...so Thank you! - you know who you are! I know you'll take good care of Jessie! For all you sellers, on Etsy or anywhere else....I would love to hear about your first sale. What is was...and how you felt. Today I was relieved. My shoulders are now relaxed and I finally was able to take that deep breath and exhale with my first sale. This weeks Giddy-Up Friday is all because Edible Wednesday got me thinking about oranges. It's the perfect color for the fall season and it's the perfect smell, cleansing and invigorating. Paired with cloves as in Russian Tea, it's a whole new experience. This would actually be called a Pomander, but I am not adding all the extra spices or oil for preserving. My girls have a special bookcase in the craft room for their "works" (the Montessori word for activities). One of the works uses styrofoam balls, ball top pins and flower sequins. As soon as they were "old" enough, they were allowed to take the balls, 'thread' a few flower sequins on the pin, and poke the pin into the ball. Once the ball was totally covered with sequins, it becomes a beautiful ornament or decoration. Making a pomander would be the step before using pins. It can help develop a child's fine motor skills and dexterity. I imagine allowing my girls to do this project once again the day before Thanksgiving, so we might have some beautiful table decorations. Oranges and Whole Cloves. Tooth picks will help break open the skin of the orange so the cloves don't break. After laying down a work space, give your child a toothpick with one end blunt to avoid injuries. Poke a small hole in the orange and insert whole clove. Be gentle with the flower of the clove, it will break easily under pressure. Continue the process to have as many cloves in the orange as you'd like. Really the only thing to decide, is pattern or no pattern! To use as table decorations, add a ribbon to the top and use a pin to hold the ribbon in place. To use for seating arrangements, make name cards, glue to a toothpick and insert toothpick into the top of the orange. This won't be just for kids - it's too much fun and it smells amazing! I'm not sure how long these will last. Beware of fruit flies for those of you in warmer climates still. (I heard Apple Cider Vinegar in a small dish helps rid of those pesky things). So I start to get into my routine and then my dh takes the week off to spend with me which gets me off my routine. Today took a nice long walk so I can't complain - and I'm not (complaining), but I was hoping to get this up sooner today!!! This is another one of those "for as long as I can remember"recipes. I can't say I remember the story behind "Russian Tea", but I remember looking in the jar and seeing the colors swirled around like colored sand. I remember the smell of the cloves mixed with the orange tang. For years I tried to find a tea packet that would give me the same taste, the same aroma, but I assure you, nothing was the same. Mix all ingredients together and keep in tightly covered jar. Use approximately two heaping teaspoons per cup of almost-boiling water. I hope you'll give this a try and pass it on (via link). It really warms the soul....and makes your house smell amazing! Comment back here and let me know what you think! Busy Monday: 10 Guilty Pleasures - And yes - they are FREE! Although I have a lot ideas of things to blog about and share with you all, I'm wanting to skip over Busy Monday - and go straight to Edible Wednesday....but I just can't do that. The week has to start with Busy Monday. So here it is. The topic I picked was actually from a post on Chris Brogan's blog. The post was 100 Blog topics I hope YOU write. I chose "10 Guilty Pleasures". It just sounds negative, doesn't it? But it's not. Not here anyway! I love a good deal! And the only thing I love more than a good deal, is anything that's free! So I'm going to share with you 10 guilty pleasures (freebies) that are great for you, your business, blog or etsy shop! 1. Know your worth. I share this tip FREELY with more people than any other. Some time ago I went to a Chiropractic seminar, back when I worked as a Front Desk Chiropractic Assistant (aka - the Fun CA!). During the seminar we were asked to turn to someone sitting around us that we didn't know. We were then asked to tell them how much their Chiropractic care was going to cost for the whole year. We made up an astronomical number and couldn't laugh or smile while doing it. The whole point of the exercise, was to help us look someone in the eye that we didn't know and be comfortable telling them we were expensive, but worth it, that their health care was expensive, but worth it! If you can't look someone in the eye and tell them your worth, work on it! If you love what you are doing, and you are putting in all the effort one would expect, then, you are worth every penny. 2. Everyone should be on Facebook. My husband is not. My mother is not. But they should be. Why? Because everyone else is. We don't have to friend everyone in the world, but it's a great way to connect to your audience. And it's free! If you are not already a FAN of Kid Giddy...now is your chance! 3. Be a Chatty Kathy. If you are just starting out an Etsy store - or are already big....you can still benefit from chatting and/or posting on forums. Newbies like me, need that online community to meet new people and get my store out there. You can also ask questions and get critiques on your store from other people that have been where you are! No matter what, it's free advertising. It gets your name out there. But set a limit or you might be on too long! 4. US - Small Business Administration. The Small Business Administration has endless amounts of free information. Need I say more about that? 5. Track your viewers. Site Meter and Feedjit. Know where your friends are coming from. Did you pay for advertising on someone elses blog or site? Is it working? These are the sites that will help you know it! (Feedjit is free for 10 days. Not bad to try it out!). 6. Want a cute blog for free? The Cutest Blog on the Block has endless amounts of HTML codes for really cute blogs!!!! They have FREE backgrounds, buttons, banners and so much more. 7. Comment on other Blogs. It's free. Find something you love and comment on it! Let the person know you were there! They just might to check out your site! 9. Journaling. Where have you been, where are you now, and where are you going? If you don't already have a place to write down your thoughts and daily happenings, here's an online journal to keep track of your personal or business everything! It's good to have a record of what phone calls you made, maybe your sales, or how you felt when you finally achieved your goal! 10. Twitter. I have a personal site I don't use. But will be setting up a Kid Giddy site later today!!! It's free folks! And again - everyone else is twittering about something - so I guess we can too! All of this for free??? How can it be? I know - I thought the same thing. Sometimes - the best things in life are free! Which is why I'm still giving away 5 FREE gifts to my first 5 sales in my Etsy Shop! So get yours!!! Our first Giddy-Up Friday kicks off with our very own Apple Sequencing cards. While my daughters attended a Montessori school, I was privileged enough to volunteer in their classes. After their Apple eating and Pumpkin picking field trip I got the inspiration to make this Apple Sequence Card set. After each juicy bite, I took a picture. We later gave a set to the school which proved popular with the kids. If you head off picking apples this weekend, have your child put the cards in order. I recommend you mount them on card stock or construction paper for sturdiness and take them to get laminated at a near by copy center to avoid having to throw them out from sticky fingers! You can also put the numbers 1-12 on the reverse side and have your child put the cards in number order. 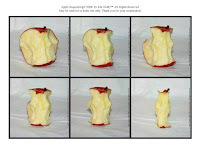 If you'd like to share this Apple Sequencing post with others, I'm happy to allow you to do that by sharing the link to this blog post. Please do not post these images elsewhere on the internet without expressed permission. Thank you in advance. Today is October 15th, and that means we have a winner! I asked readers to take a look at the Kid Giddy Etsy shop, and then come back to the Welcome to Kid Giddy post and leave me a comment to let me know which item in the Kid Giddy shop you like best. Although Sam was kind enough to leave 3 comments, I only put her name in the hat once. But lo and behold my sweet girl Elephant pulled Sam's name out of the hat. Thank you to all who entered. Our next giveaway will be announced soon. So please be sure to check in often to see what's going on at Kid Giddy. Cherry Salad - two words you might think don't belong together, make my heart sing! This recipe has been in our family for as long as I can remember. Every year for Thanksgiving and Christmas it would sit right on our dinner plates next to the turkey and mashed potatoes and gravy! Oh - no folks - it's not for dessert!!! It's part of dinner. I know that sounds crazy, but I think we all just couldn't wait for it and wanted to make sure we had some before our stomachs were full or overflowing! We didn't care much for the pies and ice cream! Thanksgiving and Christmas just weren't the same without Cherry Salad! I'm sure there was some justification on our parts because it had the word "Salad" in the title....but I can assure you, you've never had a salad like this! You will need a large mixing Bowl and a spoon and a spatula (both for licking clean when finished)! Next combine all the ingredients except the cool whip and the cherry pie filling. Make sure to mix well. Then fold in the cherry pie filling and then fold in the Cool Whip. I say fold, because you don't want to crush all the cherries, and you don't want to flatten the cool whip. The best way to eat it is to let it sit overnight. I personally cannot wait that long so I enjoy a little bowl right away and of course lick the spoons. If you are strong and let it sit overnight the marshmallows will absorb the juices and melt in your mouth. If you don't want to use all of it at right away, you can put some back into your cool whip containers and freeze them! This little trick was a whole new concept to my mom. I guess we ate it up too quickly to ever have any leftovers to freeze and scoop like ice cream! I hope you will give this recipe a try. And if you do, I hope you'll come back and drop a comment here letting me know what you thought! ps...A very good friend of mine is very much Gluten free and LOVES this stuff. So if you are Gluten free too, and you check all your ingredients, enjoy! Hello Pinterest lovers! I wanted to give a little shout out and say thank you for all the comments and love and pins...this post is currently at 450K + pins and I'm in shock! I've seen a lot of new blog posts popping up around the internet with this recipe and variations of it. Please be sure you are not copying my recipe and posting it as your own. I know it's not "original" but as seen in the comments below - you can tell we all have the ratios a bit different from how we grew up with it since the late 70's. If you'd like to share the recipe on your site - please only provide the link and not the recipe. Thank you again for all the love! Please visit some of my other commonly pinned sewing tutorials - the Modular Star, Flower Pins, Mini Tent, Grass Picnic Blanket and the Scrappy Owl. Come chat with me on Facebook and see a little bit of my world through Instagram! Good Morning everyone. Last week was crazy for me and I was off in New York helping family which meant I was unable to share some awesome treats and fun times for Wednesday and Friday. But rest assured I am all set for this week! This week for your Busy Monday....I've put together a list of blogs and sites that sell advertising spots and that get a significant amount of traffic. Many of these blogs I personally love! And some I have only recently discovered. If you have a great blog or site to add to the list, please comment below so others can check it out too. The advertising spots range in price from as low as $5.95 per month to more than $80 per month and vary in size and location. Some sites are based on bids for impressions. Please check out each blog to see if it's right for you! I have not personally sought advertising on any of these blogs with the exception of Indie Handmade as listed below, but have compiled this list for my future use and wanted to share the information. If you should have troubles with any of the sites listed below, please let me know so I can remove them immediately from the list. If you have an Etsy shop, you can also buy "Showcase" spots. It may be very difficult to get some of the more popular categories, but if you check in daily to see which ones have openings you can get something. I have purchased a Showcase in Bags & Totes for October 18th, and also a Children's Showcase for October 21st! Indie Handmade is the first place outside of Etsy I have purchased advertising for my kidgiddy.etsy shop. It is an online marketplace for all things handmade. I had submitted my shop for Holiday consideration and will later be included in their shops listing and through out the website for the Holiday 2009 season. I'll let you know how it goes. If you want more traffic to your blog or need more business for your Etsy store, advertising is the way to go! Have a great and successful Monday! So these past few days while my daughter was sick, I thought about my blog. I thought about other cool blogs. I thought about my "business". I thought a lot! As I was thinking I came up with a few ideas for my blog. On "Busy Mondays" I'm going to share some information related to business. Starting a business, getting down to business, working your business, and all that jazz. Today's awesome website I wanted to share with you all is the Mom Inventors website. It's jam packed with forums, links and all the info you need if you have invented a product or want to become the Boss of your own business. 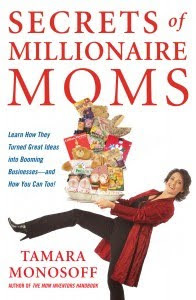 This is her first book that I love and own: The Mom Inventors Handbook: How to Turn Your Great Idea into the Next Big Thing, published by McGraw-Hill in 2005. I highly recommend you get the book, click the link above for online or in store locations or find it at your local library! It is worth the read! On "Edible Wednesdays" I'm going to share a favorite recipe - starting with awesome family recipes that I can't live without and hope you will enjoy, and then sharing some that I've been lucky enough to get from restaurants and other secret locations! And "Giddy Up Fridays" will be the fun day for the kids day! I have 2 girls and we have plenty of fun crafts to share, websites we love, and other things you can do and see just in time for your weekends! I hope you'll follow along throughout the week and feel uplifted and inspired to try something new.